My favorite place to watch the tree lighting is from Snowflake Lake. I would skate during Session 1 just for this purpose. During the countdown and until the end of the song, the colored lights shine all around the rink too and it's really cool (given it doesn't throw off my balance! ). I cannot wait to experience that again this Winterfest! Reports are that the second train is running on Flight of Fear tonight. Anyone know what is open for winterfest ERT for gold pass members? As Winterfest is more about the experience of the lights and entertainment, I do not believe that there is any early ride time during Winterfest. Just as there are no Fastlane passes sold during Winterfest. (The Fast Lane line for Mystic Timbers is once again a Single Ride Line during Winterfest). IS shops, and getting your skating tickets is the only "ERT". Edit: Yes @malem, FOF is 2 train op tonight. I don’t believe there is an ERT during Winterfest. 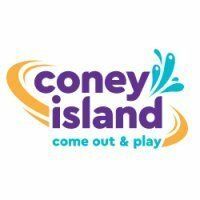 I figured that, but the way I read the website was that there is early ride time for every public opening day, except Fridays of Haunt & (Fridays of) winterfest. But I guess it's actually supposed to read more like: except Fridays of Haunt & (all of) winterfest. Does The Sweet Shop have special holiday flavors of cotton candy...such as candy cane, egg nog or God forbid fruit cake? There are some holiday flavors, can't remember which ones. Here you go. I knew it was a good idea to take a photo. I may have missed some flavors. There were a lot. Thank you both...and thanks to the food department for coming up with these! I always try and pick up the odder flavors. 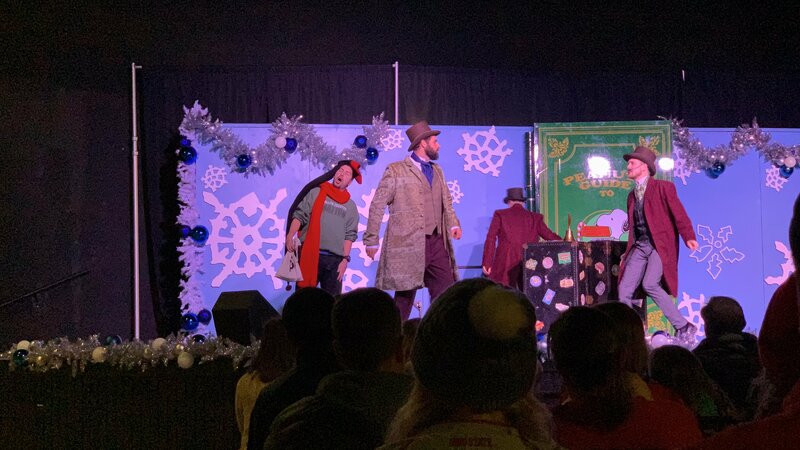 My family and I will be heading to the park next weekend...there is so much to do at Winterfest, and since our time is always limited I always try and make the most of it. I never want to waste any time looking for something that doesn't exist...so now I know what to look for. So, last night was amazing! I did 3 laps on Flight of Cheer (FOF with a Winterfest re-theme) and I can say that Project Flight of Cheer is a smashing successes! The first time I rode was in the Single Rider Line and since I was the first Single Rider of the day, it felt like I was doing a sneak preview or something (also, the fact that the trains were being gradually loaded- one train only loaded the first car, the second train loaded the first 2 cars, etc- added to that feeling), so that was a really neat experience. 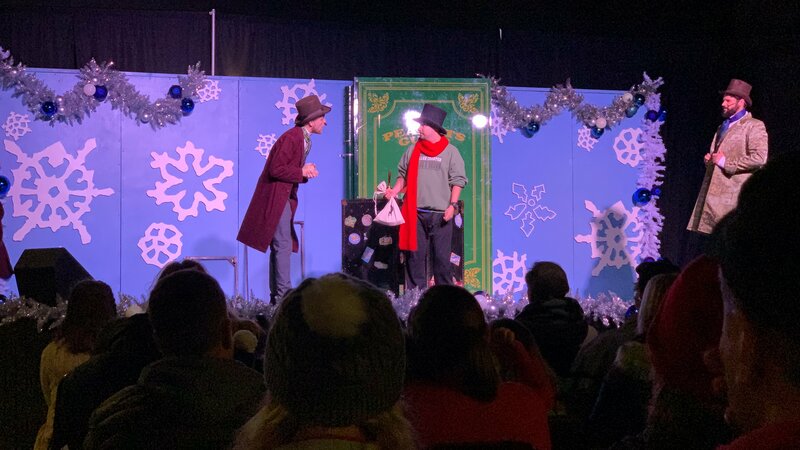 I also saw 4 Drummer Drumming, Tinkers (I cried a tiny bit during Tinker's "Believe" song), The Peanuts Guide to Christmas (this was the first time I saw it and it was not bad), and What the Dickens (I got to be Scrooge and it was great; @BoddaH1994, if you'd like to post the pictures, you have my permission ). I also wandered over to the Petting Farm to see and pet the adorable sheep, who really wanted food but were still ok with being pet. In addition, I rode the train and it wasn't as bad as last year- it was really nice (Fun Fact: I rode on the Green Train's final lap). I also did see some characters including Mr. Tannenbaum and the ghosts. Speaking of ghosts, I still need to say hi to Marley and Scrooge; the former of which looks like he'd fit right in at Haunt with all those chains and whatnot. Finally, I did two Pokémon Raids with @Magenta Lizard and that was fun; I also hatched a ton of eggs thanks to Adventure Sync! In addition, I rode the train and it wasn't as bad as last year- it was really nice. I was planning on skipping the train this year because it was the ONLY thing that I thought was completely worthless last year. As I mentioned in a post above, our time is limited at the park. It is a 3 1/2 hour drive for us...so we only drive to Winterfest once a year...we do go 2 evenings though, but we still struggle to experience everything we want. So, is it improved enough that you would recommend it? Same decorations up, but the train has more music, decorations, and both trains running. @standbyme: I think the train improved as it seemed to go faster than last year (the slowness of the train scared me as I thought something in the woods was going to attack the train). @harmony29 Facebook has tons of complaining in comment sections. Seems like the unhappiest of people are on there, and are the loudest. For that exact reason, I don't even bother reading comment sections anymore. People just complain to complain. My first shift of Winterfest is tonight, and I am excited! If any of my fellow KICers plan to attend tonight, they have their chance to be the first KICer to ever spot me working as a sweep and not a ride operator! Since I am in Park Services, I can be found on any walkway in the park. Are you up for the challenge? Even if you're not the first to find me, say hello anyway! I love seeing fellow KICers when I'm at work, whether it'd be at Vortex, WindSeeker, or anywhere else! So, last night was amazing! I did 3 laps on Flight of Cheer (FOF with a Winterfest re-theme) and I can say that Project Flight of Cheer is a smashing successes! The first time I rode was in the Single Rider Line and since I was the first Single Rider of the day, it felt like I was doing a sneak preview or something (also, the fact that the trains were being gradually loaded- one train only loaded the first car, the second train loaded the first 2 cars, etc- added to that feeling), so that was a really neat experience. Ok. Tell us more about Flight of Cheer. Music? Decorations? Sights and sounds? What's the buffet option for dining plan? Is the Fast Lane entrance at FoF the single rider line? Gonna try to put some laps on her tonight since the wife went shopping. 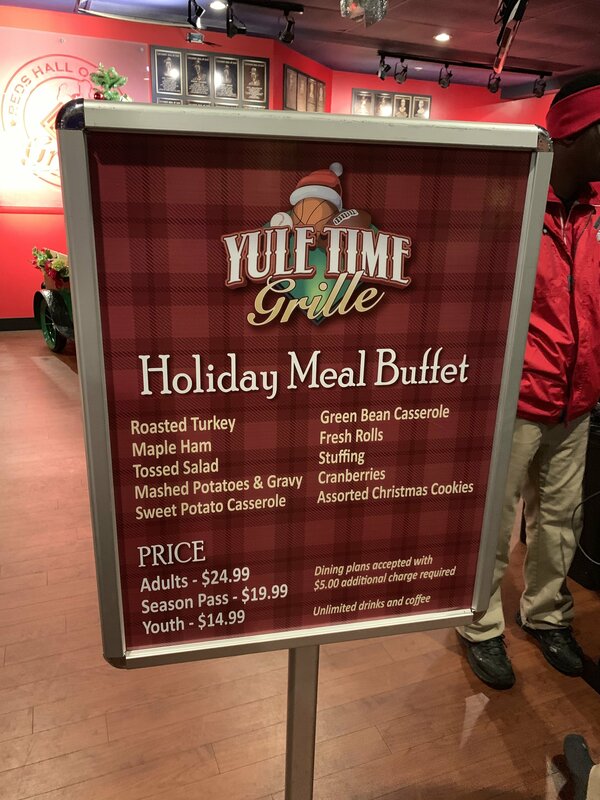 The Reds Hall of Fame Grille buffet is on the dining plan. The price is $24.99, or $19.99 with a season pass, or a $5 upcharge as a dining plan redemption. The Fast Lane Plus entrance is indeed the single rider line for WinterFest. My interview with Don about Winterfest 2018. No other items were discussed. Went to Winterfest for the first time last night & LOVED IT! Hoping to go back during the run this season! I would have to say Sounds of the Nativity was my favorite show followed by Four Drummers Drumming. By chance, does anyone have a playlist of songs from Winterfest?! I had heard mixed reviews between Facebook and KIC and I can say that I can concur with all of it - good and bad. I want to start off by saying that the stuffing was some of the best I had in a long time. It was very basic but had a very rich flavor. The mashed potatoes were very good and buttery too. The turkey was good but wasn’t mind blowing. Some of the negative things I had heard was that the food cold, dried out, and slow to refill. I didn’t experience any cold food, but they were out of mashed potatoes my first time through and I had to swing by a few times over the next 15 or so minutes to see if it was refilled before it was. The rolls were hard and smashed flat, as if the pans had been stacked on top of each other. Some friends I was with ate it on Friday and said they had several types of rolls that night and they didn’t offer that this time. Over all I felt like I got a good deal for the $5 upcharge, but wouldn’t have been thrilled with it if I had spent the $25 for the full price. All this stuff is logistics that can be worked out. 1st: @IndyGuy4KI; great Interview! I still say it is impossible to do everything in one night. I've been yesterday and today (more on that in a bit) and there are still a few things I'd like to check out (ex: I haven't yet ridden Boo Blasters or the Carousel during WF and there's still probably like 3ish shows I haven't seen this year). 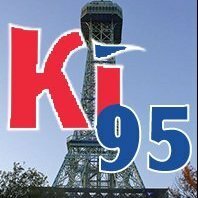 3rd: @ki95- I know two of the songs are Ariana Grande's "Santa Tell Me" and "Celtic Carol" by Lindsey Stirling. 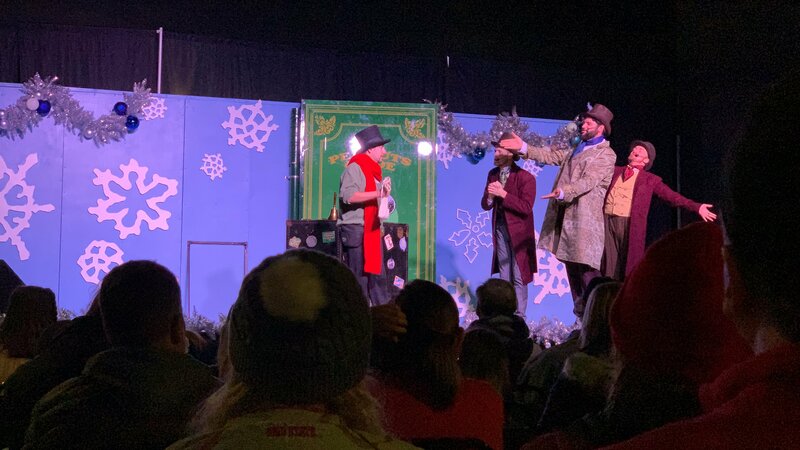 4th: I had a blast tonight: got 3 laps on Flight of Cheer (as well as rode Mystic and Shake, Rattle and Roll once), got to meet Marley and talk to Scrooge, saw Holly Holiday (aka Tana Matz) sing on the Back Patio, pet the sheep again as well as listened to the Sounds of the Nativity. I also saw Jingle Jazz, had some fun with Mr. Tannenbaum and did some Pokémon-related things. Finally, re: Carolyn's challenge... I was the second person to see her, but I got the M&M's as the 1st person refused them. I ended up giving them to a guy I recognized from Cirque after successfully trying to pawn them off while in line for Mystic Timbers lol. EDIT: Also ran into @Rallyomalley as well as other KICers that were in the park. I only rode Flight of Fear once tonight, but the train launched faster then I ever remember it from this summer. We still had a ton of speed when it reached the MCBR. Even better while the brakes activated we left the MCBR with some actual speed, I was so used to the train basiclly stopping I was extremely surprised. It was the fastest and frankly best ride I remember ever having on FoF. I had the buffet in RHoFG on Saturday. It was around 7 PM so it was pretty slow. There was plenty of food and nothing was out while I was there. The food was very good, except the turkey is just a little plain, I would stick to the ham instead. I thought it was worth the extra $5 and am likely to eat there again.